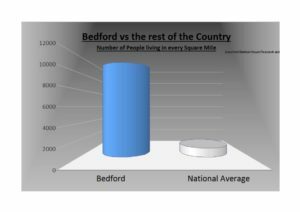 Bedford Property Blog | Bedford Property Market : 11,200 People Live In Every Square Mile Of Bedford – Is Bedford Over Crowded? Bedford Property Market : 11,200 People Live In Every Square Mile Of Bedford – Is Bedford Over Crowded? Bedford is already in the clutches of a population crisis that has now started to affect the quality of life of those living in Bedford. There are simply not enough homes in Bedford to house the greater number of people wanting to live in the town. The burden on public services is almost at breaking point with many parents unable to send their child to their first choice of primary or secondary school and the chances of getting a decent Dentist or GP Doctor Surgery next to nil. 11,200 people live in each square mile of Bedford, it’s no wonder we appear to be bursting at the seams! … but yet again, newspapers, politicians and property market bloggers quote big numbers to sell more newspapers, get elected or get people to read their blog (I recognise the irony!). A square mile is enormous, so the numbers look correspondingly large (and headline grabbing). Most people reading this will know what an ‘acre’ is, but those younger readers who don’t, it is an imperial unit of measurement for land and it is approximately 63 metres square. In Bedford, only 16.02 people live in every acre of Bedford … not as headline grabbing, but a lot closer to home and relative to everyday life, and if I am being honest, a figure that doesn’t seem that bad. Yet, the issue at hand is, we need more homes building. In 2007, Tony Blair set a target that 240,000 homes a year needed to be built to keep up with the population growth, whilst the Tory’s new target since 2010 was a more modest 200,000 a year. However, since 2010, as a country, we have only been building between 140,000 and 150,000 houses a year. So where are we going to build these homes .. because we have no space! Or do we? 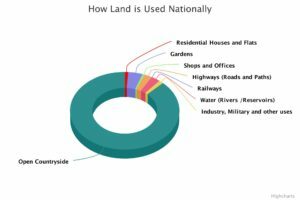 As a country, we have plenty of space to build more homes for the younger generation and the five million more homes needed in the next 20 years would use only 0.25% of the country’s land. Now I am not advocating building massive housing estates and 20 storey concrete and glass behemoth apartment blocks next to local beauty spots such as Harrold-Odell Country Park or Bedford Park, but with some clever planning and joined up thinking, we really do need to think outside the box when it comes to how we are going to build and house our children and our children’s children in the coming 50 years in Bedford. If anyone has their own ideas, I would love to hear from you.